Leading coral reef scientists in Australia and the USA say there needs to be a new approach to protecting the future of marine ecosystems, with a shift away from the current focus on extinction threat. Giant Humphead Parrotfish – image credit: JP Krajewski. “Extinction is the endpoint, but coral reefs are in deep trouble long before we get to that point. We need to take action much earlier,” says Professor David Bellwood from the ARC Centre of Excellence for Coral Reef Studies (Coral CoE) at James Cook University. “The goal should be to maintain reefs that can support corals, fish and humans,” Professor Bellwood says. In a world first study published in the journal, Current Biology, researchers tested the concept of ‘double jeopardy’, which is widely used to assess extinction risk. It is based on the assumption that the risk of extinction is greater if a species has both a small geographic range and low numbers. The researchers counted the numbers of individuals of more than 400 species of fishes and corals across a 10,000 km swathe of the Pacific Ocean, from Indonesia to French Polynesia. Professor Terry Hughes from the Coral CoE says they found no relationship between each species’ abundance and its geographic range. To the contrary, the researchers found that some species with a small range had large numbers while some with a vast range spanning the Indo-Pacific Ocean were quite rare. The widely held assumption of double jeopardy is false. “Our findings call into question the growing practice of assessing extinction risk of coral reef species without knowing how many of them are out there,” says Professor Hughes. 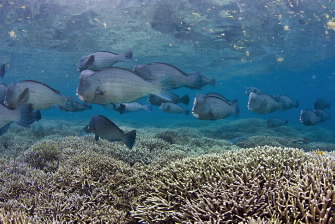 “This is the first study to systematically count corals and reef fishes at a geographic scale”. “The vast majority of marine plants and animals are comparatively resistant to global extinction because of their high rates of reproduction, ability to disperse widely, and huge geographic ranges which span up to tens of millions of square kilometres,” Professor Hughes says. “Rather than guessing which species are threatened, we need a focus on local action to avert or recoup the loss of ecosystem function caused by habitat destruction and severe depletion of key species,” Professor Hughes says. Professor Bellwood adds “This paper calls for caution when identifying species at risk of extinction on coral reefs. It highlights the potential weaknesses in current approaches and offers an alternative approach where species are valued for the services they provide for both reefs and humans”.